By now, you should notice -- or, shall we say, you should be aware of -- several themes running through this book. One of these themes is awareness itself. You cannot change what you are unaware of. This truth is nowhere more important than in the world of self-improvement. We need to be more aware of what we are doing, what we are thinking, and what we are intending to accomplish in order to gain control of what we experience in life. But in fact, for most of us, this is a problem because we are so disconnected from our thoughts. We just have them. The horses are running, and we don't have the reins. We need to become an observer of our thoughts and actions, like an instructor watching a student performing a task. The instructor is not judgmental or emotional. The instructor knows just what he or she wants the student to produce. The teacher observes the student's actions, and when the student does something that is moving in the wrong direction, the instructor gently brings it to the student's attention and pulls the student back onto the proper path. A good instructor does not get emotional in response to the student moving off the path. That kind of negative emotion comes from expectations, and that is not the perspective we want to have if we are to be our own instructor. Expectations are tied to a result or product, to the thought that "things should be this way right now, and until then I won't be happy." When you experience these kinds of emotions, they are indicators that you've fallen out of the process, or out of the present moment. As when we were throwing tennis balls into a trash can, we should observe what happens, process the information without emotion, and then move on. This is how we should deal with ourselves as we work at learning something new, or when we're changing something about ourselves that we don't like. This includes working on something more abstract, too, such as becoming more aware or conscious of what we are thinking, becoming more of an observer of ourselves. This disconnection from our thoughts and actions is a way of thinking that we have learned during our lives, and one that takes away all our real power. We must unlearn this approach to life. What we are really talking about here is a habit. Everything we do is a habit, in one form or another. How we think, how we talk, how we react to criticism, which type of snack we instinctively reach for: all are habits. Even when faced with a circumstance for the first time, we respond to it from habit. Whether we observe our thoughts or they just happen in our minds is determined by habits we have learned. We may consider some habits good, others not so good, but all habits can be replaced at will, if you understand how they are formed. Habits and practice are very interrelated. What we practice will become a habit. This is a very important point because it underscores the value of being in control of our practicing minds. Our minds are going to practice certain behaviors whether or not we are aware of them, and whatever we practice is going to become habit. Knowing this can work in our favor. If we understand how we form habits, and if we become aware of which habits we are forming, we can begin to free ourselves by intentionally creating the habits we want instead of becoming victims of the habits we unknowingly allow to become a part of our behavior. We can gain control of who we are and what we become in life. But what are the mechanics that create a habit? Knowing this would be quite valuable. Fortunately for us, we don't have to figure this out, because others have already done it for us. The formation of habits has been studied extensively by behavioral scientists and sports psychologists alike. Understanding how desirable habits are created and undesirable habits are replaced is invaluable, particularly in repetitive-motion sports such as golf or diving. In fact, you often see golfers practicing certain parts of their swings over and over again, or divers standing poolside, going through the motions of complex dives they are about to execute. They are practicing and habitualizing their particular moves. What does that mean? To me, when we say that something is a habit, it means that it is the natural way we do something. We do it intuitively, without having to think about it. The martial arts student practices the moves over and over again, habitualizing responses until they become effortless, intuitive, and lightning fast. There is no intellectual process that has to occur in a time of crisis where the brain is saying, "My opponent is doing this, so I must do that." The responses just happen because they are a natural part of the student's behavior. That is what we are after. We want something like being more aware of our thoughts to be just a natural behavior, not something that requires a lot of struggle. Getting to this point is not complicated. It does take some effort, but the effort is minimal once we understand the process. What is required is that you are aware of what you want to achieve, that you know the motions you must intentionally repeat to accomplish the goal, and that you execute your actions without emotions or judgments; just stay on course. You should do this in the comfort of knowing that intentionally repeating something over a short course of time will create a new habit or replace an old one. *Excerpted from the book The Practicing Mind: Developing Focus and Discipline in Your Life Copyright C 2012 by Thomas Sterner. Printed with permission from New World Library. 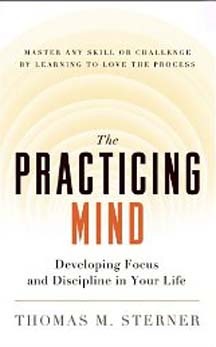 To order The Practicing Mind from Amazon.com, click here! Thomas M. Sterner is the author of Practicing Mind: Developing Focus and Discipline in Your Life. He's also a trained jazz pianist and an avid pilot, student of archery, and golfer. He teaches his techniques to businesspeople, at sports clinics, and to learners of all kinds. He lives in Wilmington, Delaware. Visit him online at http://www.thepracticingmind.com.